Another monochrome photo from September. I have been enjoying doing that with these, it gives them more of a depth. This photo is a destroyed church. I did try so many other images, but they didn’t go well. This entry was posted in Photography and tagged Black & White, Landmarks, Monochrome, Nikon, Nikon D3000, Photo of the Week, Photos, September. Bookmark the permalink. I thought about taking photos of headstones, but felt some people may not like it. I have a personal fondness for monochrome. It’s generally used for people, but I think it works really well for landscapes. It’s easier to look at the shadows and textures. I agree, it does bring out more than you see in the colour images. Inviting … and the choice of B&W is a good one. Thank you. I have this week’s one provisionally taken. It may change by the end. Thank you Raewyn. It’s why I used this one. I have liked all three black and white photos this month. It’s going to be difficult to choose. I’m glad it isn’t going to be me. It looks like a 1940’s picture of bomb damage. Thank you. It was fire damaged before being bomb damaged. Me. I bombed before the firs. But I think that was the jalapeños. Really like your black and white. Thanks Yoshiko. I was very happy with this one. 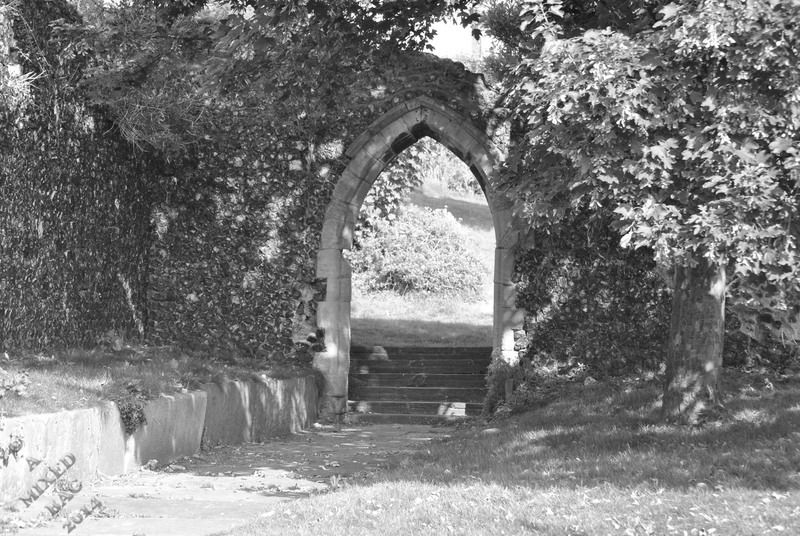 The black and white go beautifully with the setting, especially looking through the doorway. Great job! Awesome, even.